Here's a little news to prove to Mr. Attitude that I'm not just a trumpet for Apple's successes. 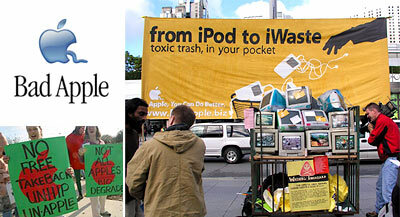 Environmental activists engaged in demonstrations outside of the company's Cupertino headquarters and at MacWorld this week, calling on Apple to become a leader in electronics recycling and to reverse its habit of lobbying against legislation that would enact "shared responsibility" solutions whereby manufacturers would be held partly responsible for the end-of-lifecycle recycling and/or disposal of their products. Yes, it's true. Apple could (and should!) be a lot better in this realm of corporate citizenship. To learn more or to write a letter to Steve Jobs, visit the Computer Take Back Campaign website, www.BadApple.biz.